We’d love your help. 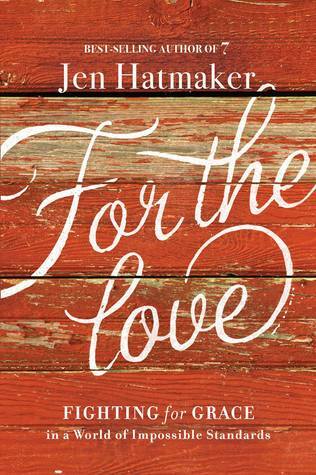 Let us know what’s wrong with this preview of For the Love by Jen Hatmaker. The majority of our joys, struggles, thrills, and heartbreaks relate to people, beginning first with ourselves and then the people we came from, married, birthed, live by, live for, go to church with, The popular writer, blogger, and television personality reveals with humor and style how Jesus' extravagant grace is the key to dealing with life's biggest challenge: people. To ask other readers questions about For the Love, please sign up. I want to read this book as I love Jen Hatmaker but is this a book that non-Christians can enjoy? What resonated with you most from this book? This book is worth more than 3 stars, but in light of all the 5-star reviews here and on Amazon (written by young bloggers, probably) I find myself compelled to provide a counterpoint. For the Love: Fighting for Grace in a World of Impossible Standards is a fun stream-of-consciousness roller coaster ride through the rants and raves of a Jesus-loving, preacher's wife and mother-of-5, sprinkled with a little minor celebrity glitz. It is, therefore, not what I expected. The book is truly funny, easy This book is worth more than 3 stars, but in light of all the 5-star reviews here and on Amazon (written by young bloggers, probably) I find myself compelled to provide a counterpoint. For the Love: Fighting for Grace in a World of Impossible Standards is a fun stream-of-consciousness roller coaster ride through the rants and raves of a Jesus-loving, preacher's wife and mother-of-5, sprinkled with a little minor celebrity glitz. It is, therefore, not what I expected. The book is truly funny, easy to read in small snatches and occasionally makes a great point of practical theology. (“If you can make a pot of chili and use a cell phone, then you can create community.” Or, “Anytime the rich and poor combine, we should listen to whoever has the least power.”) However, it is not what I expected because the title suckered me. I thought it was going to be a straight-up education about grace applied to ourselves primarily and others secondarily, something we all sorely need, whether we are coming from the get-your-life-in-line end of the spectrum or the let-it-all-hang-out end. But it's not. After the wonderful Introduction, grace is never directly addressed again, and there are whole chapters which don't even use the word. There IS a chapter on fashion, multiple chapters addressing pet peeves, Jen's life in Facebook posts and several intricate recipes. Yes, there are a couple more serious chapters about missions (ala When Helping Hurts) and church leaders, but there is approximately one Bible reference (ok, I found three more in the second-to-last, confusing chapter encouraging women to lead more) and for a book touting grace, I felt kind of ragged on a few times. I could be the author's mother (if I'd had a couple rough and/or promiscuous teen years), so there's one other thing I've got to say: sometimes this good-hearted lady knows not of what she speaks. By her own admission she hasn't been through a lot of hardships. She has a loving pastor-husband, five great kids who are still at home, and she and her friends cheer on one another's published books, released CD's and popular podcasts. Talk to me again when there's only one of you working on your marriage, when your grown child has embraced atheism, when you've had a significant part of your body disfigured, or when your best friend or your dreams have died a slow death. Then you can write a serious book aimed at lifting burdens, explaining modern dilemmas or applying grace to self-condemnation. Until then, please adhere to truth in advertising by subtitling your book: Funny Blogs about Being a Middle-aged Christian Mom. I have read so many good things about Jen Hatmaker, and know It is rare that I actually end up reading a "trendy" book right at the height of it's trendiness - but somehow I heard about Jen Hatmaker's For the Love enough in advance that I am able to give a timely review of the "big book to read", for once! You are welcome, my readers who like book reviews. I will try to work this out more often. I have read so many good things about Jen Hatmaker, and know so many people who declare her one of their favorite authors. After reading her book, I can understand why her writing is so popular. She has a great sense of humor, and that comes through in much of her writing. I found myself chuckling several times through this book, which is always a plus. The chapters honestly felt a little disconnected to me, but once I finished the book I could think back over this seemingly random assortment of topics and see the common thread. Several chapters also seem to be thrown in for the sheer humor, and I thought that added a fun aspect. Despite so much of the book being entertaining, I was pleasantly surprised by the snippets of wisdom included throughout, especially regarding relationships. I very much appreciated the chapters on calling (1 and 3), difficult people (18), and her letters to church attenders and leaders (22). All of these chapters gave me some insights and encouragement. There were a couple minor negatives that I am mostly going to gloss over (such as humor that bordered on too irreverent for me, too many references to drinking, and a minor disagreement about the role of parents in education), because there was one larger point that was more concerning to me that I would like to focus on. The book started to take a downward turn for me at about page 71, with a line about God measuring our "entire existence" by how we love God and love people. Although Christians should certainly do both, that is a very vague idea. Lots of people can "love God and love people" and still have no idea who Jesus is. I don't think God measures our entire existence based on those two things - it is also supremely important what we believe about His Son. In chapter 13, Hatmaker starts talking about some of the recent statistics about the growing of the "nones", people who claim no religious affiliation, and the decrease in people who identify themselves as Christians (Focus on the Family recently had a broadcast with a really good discussion of the statistics that gave me a better understanding of what is actually going on, for those who would like to know more). She then started talking about our post-modern culture, and how the younger generation is leaving the church. In her view, this is because the younger generation doesn't like when people act like they know all the answers - they think "I don't have all the answers, and neither do you". I think that is true, but I don't really like how Hatmaker suggests we handle it. She says the younger generation wants depth (which I don't disagree with) and suggests pointing to Jesus (of course), but only references Him as the best "example", and talks about His life's "legacy". It concerned me that she mentioned "the gospel" throughout this chapter, but never clearly spelled it out, and then only referred to Jesus in terms of His example and legacy. The gospel is so much more than that. We are not giving the younger generation, or anyone, "depth" if we are not talking about the reason Jesus came - and he didn't just come to be a good example, He came as God in the flesh to die in our place as an atoning sacrifice for our sins. That is the gospel, that is depth, and it is beautiful, and I think we are losing the younger generation more because we are watering that down. They don't need just a good example, they need the truth - and sure, no one has all the answers, but God does, and His word is truth. Unfortunately, I think Hatmaker's book misses the mark on communicating these things, and that is a problem for me. Ironically, after ironing out all my feelings on this in my head, I sat down to finish the book and came to a chapter entitled "Dear Christians, Please Stop Being Lame", in which she lightly scolds a (maybe) hypothetical Facebook commenter who expresses some of the concerns I mentioned above (although in a not-super-nice way). While the chapter's overall point is valid (that we should love our brothers and sisters in Christ and that will show the world how we are different), Hatmaker seemed to suggest that concern or correction of wandering theology is not showing love to each other (I disagree with this). Now, certainly there is a right and wrong way to address these kind of concerns to someone, and it is important to do that in love - if you cannot address concerns lovingly, you should probably stay silent. (Also ironically, calling out your critics publicly in a book and talking about how they give you a migraine and you are becoming "intolerant", presumably of their lack of love - pg. 190 - is not necessarily the most loving way to handle disagreement either). Hatmaker suggests the idea that trying to figure out "rightness and wrongness" is making people feel like outsiders, and then closes it up by suggesting "the highest level of 'right theology' involve[s] loving God and people like Jesus suggested" (pg. 195). I very much disagree with that, for all the reasons I mentioned in the above paragraphs. It is dangerous to suggest that we stop striving for right theology. Yes, there are some areas in God's word that are peripheral and can be interpreted differently, and I agree that no one is going to get every point 100% right, but we should always be going back to the Bible to find the answers. God does give us answers to the important questions there, and right theology does lead to godly living (including "loving God and people"). To oversimplify "theology" like Hatmaker does takes a lot of the power out of it, and once again, many people can strive to "love God and people" and still not know Jesus. I hate to be the party pooper by picking apart a trendy book, and I am not trying to be overly harsh. From this book, I do think Hatmaker understands and believes the heart of the gospel, of what Jesus did in coming to die for our sins. However, I think she does a poor job (I'm sorry, that sounds harsh again) of communicating the core of our faith, probably because she mainly seems to be writing to believers. I think it is unfortunate that the opportunity to really explain the facts of the gospel was not seized. With as much buzz as this book is already getting, many non-believers are going to be reading it too, and possibly finding themselves confused about what they really need to do to be saved. I, unfortunately, cannot recommend For The Love for this reason. I don't read a lot of non-fiction, let alone Christian non-fiction, even though I AM a Christ follower. Why? Because it tends to come across preachy and well---boring. Plus, I have the attention span of a fruit fly. I need fast, funny and filling. This book is all that and a side of fries! Jen Hatmaker is the Amy Pohler/Tina Fey of Christian fiction. Whether it be the "Thank-You Notes", the chapters on marriage, social media, toxic friendships, church people (Bless.) or the stories about motherho I don't read a lot of non-fiction, let alone Christian non-fiction, even though I AM a Christ follower. Why? Because it tends to come across preachy and well---boring. Plus, I have the attention span of a fruit fly. I need fast, funny and filling. Whether it be the "Thank-You Notes", the chapters on marriage, social media, toxic friendships, church people (Bless.) or the stories about motherhood, every woman alive can relate to SOMETHING within these pages. I laughed so hard I nearly peed my pants. If Jen Hatmaker is taking applications for BFFs, sign me up. Now where shall I start? I have a few quotes, so maybe I'll start with some of those. “We are called to this work, and it might not seem like much, but if you play your one note and I pl Here’s what the internet needs to know. Jen Hatmaker is hilarious. And honest. And real. I had the chance to hear her speak at the IF:Gathering and was so encouraged and blessed. It’s no surprise then, that the same happened with her newest book, For the Love: Fighting for Grace in a World of Impossible Standards. "Don't bury that talent, because the only thing fear yields is one dormant gift in a shallow grave." "Sisters, can you imagine a world where we could be free enough to tell the truth? Letting hard things be hard and confusing things be confusing? If we fought the instinct to prop things up, to polish and tilt and arrange the pieces in just the right lighting, we would be free. We could all exhale." "As we witness this beautiful community, we aren't just observing vulnerability but rather chains breaking, darkness receding, victory riding. We are watching the light win truth by truth, and when enough bright places are created, the dark has nowhere else to hide." "Condemnation is a trick of the enemy, not the language of the heavens. Shame is not God's tool, so if we are slaves to it, we're off the beaten path." "If Jesus is the heart of the church, people are the lifeblood." "Don't fear your humanity; it is your best offering." She speaks a lot to wives and mothers, but here's the great thing about this book: it didn't matter to me, I was still highlighting and laughing just as much. Many of the issues she deals with aren't just things moms deal with. Like comparison? Yeah, I've been known to come across that a time or two. There's wisdom doled out in Jen's humorous style and I think all women should read this. From beautiful thoughts for her kids, to the chapter on marriage, to encouraging women, friendship, social justice, the church and our calling as believers, this book will not only make you smile (and laugh out loud), but encourage you in so many ways. "May we show love in big and small ways, and may that love reach people accustomed to being shamed or ignored. The bright stars shouldn't get all the attention; let's search for those whose lights are dimmed, because we are not a tribe of supernovas but of steady, collective light." Have y'all heard of Jen Hatmaker? Who are some of your favorite life/faith/women bloggers? For the Love. I struggle with where to start. I am the demographic this book was written for. I love grace. It is my word. And yet, this book felt empty to me. There were indeed moments of truth. Of my shouting YES! But it proved to be a blip in chapter. Just that, a moment. The book is separated into 4 sections. Half the chapters within each section are humor. Literally, there is no substance found in them and they are instead a "break" in the book. Personally, when I sit down to read, I want t For the Love. I struggle with where to start. I am the demographic this book was written for. I love grace. It is my word. And yet, this book felt empty to me. There were indeed moments of truth. Of my shouting YES! But it proved to be a blip in chapter. Just that, a moment. The book is separated into 4 sections. Half the chapters within each section are humor. Literally, there is no substance found in them and they are instead a "break" in the book. Personally, when I sit down to read, I want to read. I don't want breaks. I want to read truth. I want to be challenged. If I want to read a book filled with jokes and to laugh (which I most certainly did), I would use my reading time to read with my littles instead (which I do sometimes). In addition to the chapters on nothing, few of the chapters related to each other. This book honestly felt like a blog. You write a chapter (or a few posts) on one topic, then move onto something else. Then you write something light about nothing really. Then onto another topic. There were a few sections that left me feeling or wondering, "Hmmm... Not sure I can get quite on board with what you're saying. Or rather what you're reaching for there." This is to be expected when reading Christian Living books, so that was not frustrating or off putting. What was off putting and lacking grace, was the chapter on cooking. Somehow if I don't cook extravagantly that I am prioritizing wrong. Later in the book, some grace was offered. Overall, I am sorely disappointed that this book did not delve into grace. Fighting for it. Or most anything real or deep. I am thankful for 6 sticky notes (so 6 quotes/paragraphs/ideas) that were beautiful, precious, and truth-filled that I can think on further. I would have loved to see more than 6. It is a quick read, so for that I am thankful that I did not use more than a day to read about (almost) nothing. You guys, I’m not even sure what to say about For the Love. I read listened to 7: An Experimental Mutiny Against Excess several months ago and loved it. Everything from the message to the voice to the audio narrator was inviting. When I saw that Jen Hatmaker had a new book coming out, I jumped on it. I hesitate when requesting religious books for review because while I do read these type of books regularly, I don’t read them frequently enough or fast enough to really feel good about being able t You guys, I’m not even sure what to say about For the Love. I read listened to 7: An Experimental Mutiny Against Excess several months ago and loved it. Everything from the message to the voice to the audio narrator was inviting. When I saw that Jen Hatmaker had a new book coming out, I jumped on it. I hesitate when requesting religious books for review because while I do read these type of books regularly, I don’t read them frequently enough or fast enough to really feel good about being able to review them by the release date. However, For the Love’s release date was so far in advance from when I requested it and the book so short (only right at 200 pages) that I thought I could make it work. Little did I know that I would read this one just as quickly as a fiction book. That just doesn’t happen to me very often. After reading several books recently that either felt irreverent as a whole or at least partially irreverent I felt like I needed a good dose of some reaffirming religious content. Jen Hatmaker seemed like a good bet. Nothing really inspirational to be found here. Just ramblings of her espousing her own idea of what biblical grace is rather than delving into what the Word says. In fact, there is very little scripture used. If you're going to write a book about a biblical idea then you better use plenty of scripture to back you up. I don't even recall any form of a Gospel presentation. This was all around a trainwreck. Over the last few years, I've seen Jen Hatmaker pursuing relevancy to the world. But trying Nothing really inspirational to be found here. Just ramblings of her espousing her own idea of what biblical grace is rather than delving into what the Word says. In fact, there is very little scripture used. If you're going to write a book about a biblical idea then you better use plenty of scripture to back you up. I don't even recall any form of a Gospel presentation. This was all around a trainwreck. Over the last few years, I've seen Jen Hatmaker pursuing relevancy to the world. But trying to be relevant to a sinful/fallen world is the best way to be ineffective to the cause of Christ and the Gospel. To put it gently, I find some of the hot names in inspirational writing both overexposed and of exaggerated importance. Among them, Jen Hatmaker might be queen. This book has been recommended to me, and although I even find the title off-putting, I agreed to try it. What unifies this book? A catch phrase that can be applied to anything. Is there any research, any new information, any 'inspiration'? No. It is a little like scrolling through a Facebook feed. I tried to be open minded, but this is what I dislike most in publishing. Once, this person wrote something pretty good. Now, her work is published because of her name. This book started off with a lot of enthusiasm, love, and encouragement. That all three of those transitioned into humor and was relatable. I immediately recommended the book to my mom and cousin before finishing chapter 3. Jen has a fresh take on standards, real life, growing up, and just LIFE in general. I loved this book, the thank you notes, the nods to pop culture, and of course the humor. OH and I freaking need a supper club in my life, like yesterday. Do you ever feel like you're the odd woman out? That no one else gets you, thinks like you do, prays like you do or hurts like you do? It's simply not true. In For the Love, Hatmaker addresses a number of cultural, relational and spiritual issues that will resonate so deeply in your heart, and at first you'll just whisper, "Me too," but the next one will get louder, and soon you'll be crying real tears and shouting, "ME TOO!" all the while laughing at the blurbs called "Thank you notes" (and so Do you ever feel like you're the odd woman out? That no one else gets you, thinks like you do, prays like you do or hurts like you do? It's simply not true. In For the Love, Hatmaker addresses a number of cultural, relational and spiritual issues that will resonate so deeply in your heart, and at first you'll just whisper, "Me too," but the next one will get louder, and soon you'll be crying real tears and shouting, "ME TOO!" all the while laughing at the blurbs called "Thank you notes" (and so many more hilarious chapters) taken directly from her Facebook page. Jen is an amazing vessel of truth, and the more you read her work, the more you will feel like the normal human being you are. We are all in this together. "Be you because you are superb." "Condemnation is a trick of the enemy, not the language of the heavens." "You are good at something for a reason. God designed you this way, on purpose. It isn't fake or a fluke or small." Jen Hatmaker can make you laugh like no one else. For the Love is a book for every woman. It helps us not to feel alone. It helps us to forgive ourselves, to like who we are, and nonetheless, pushes us to grow more into who God made us to be. Great read! -Gillian Marchenko, author of Still Life, a memoir of living fully with depression, and Sun Shine Down, a memoir. Laughed so hard I cried...and then cried for real cause this book was so much fun, so heart tender and so delightful to read. I'm not the type of person who follows celebrities. I really don't care if your famous or not, because quite frankly we're all people. But there are two people I would like to meet in real life. One of them is John Cena. Yes, the wrestler who wears colorful T-shirts and shouts "you can't see me" and "hustle, loyalty, and respect". He's the Hulk Hogan of our time, people! The other is Jen Hatmaker. Congrats, Jen! You have reached John Cena status. I love this book. I mean, I really truly loved rea I'm not the type of person who follows celebrities. I really don't care if your famous or not, because quite frankly we're all people. But there are two people I would like to meet in real life. One of them is John Cena. Yes, the wrestler who wears colorful T-shirts and shouts "you can't see me" and "hustle, loyalty, and respect". He's the Hulk Hogan of our time, people! I love this book. I mean, I really truly loved reading every bit of this book. Anyone who knows me knows I do not get excited about stuff. But this book was a breath of fresh air. Thank you, Caillou, for having a nonphonetic title so my son cannot look you up on Netflix (155). Ya'll, I can't stand Caillou. And it appears Jen Hatmaker can't stand him either. For the Love covers a wide range of emotions and topics in a span of twenty-six short chapters. There are thank you notes, dinner recipes, rantings, ravings, confessions, and advice. She catches and keeps our attention while bouncing from one topic to another. If it isn't also true for a poor single Christian mom in Haiti, it isn't true (19). This was a breath of fresh air when I read this statement. We have a tendency to argue over secondary biblical issues, but fail to think how the text applies in a global setting. How much of our cultural preferences are applied to the Bible? This question puts a lot of these things in perspective concerning work/home balance and how we raise our children. A youth group culture geared toward entertainment is not working. Face it: We cannot out-entertain the world. If discipleship programs hinge on amusement, they'll come now but won't stay later. Why would they? Believe it or not, kids crave depth (101). There is so much truth in this statement. If you want to attract a crowd, than throw a party. The end goal of youth ministry is to develop disciples and launch them into their next stage of life with confidence in Christ and His Word. So what are some negatives of this book? The only negative is we have to wait until August for the official release. Yes, AUGUST. Can you wait two more months? I don't know if I can. This is just a tiny glimpse of why this book is awesome. So Jen, if you're ever in Virginia, I would love to meet you. And if you happen to run into John Cena, than it's a double win for everyone. We “love” people the we way we “love” ourselves, and if we are not good enough, then no one is. Jen Hatmaker has a wit and a gift of writing. She makes no apologies for her theology or lack of theology. There were some parts I loved about this book and then not so much. She is funny and if you pick this read out, you will laugh and feel like you are with a good friend that enjoys life. I loved how she addressed about over committing ourselves and it is ok to say no. I also loved and I mean loved We “love” people the we way we “love” ourselves, and if we are not good enough, then no one is. Jen Hatmaker has a wit and a gift of writing. She makes no apologies for her theology or lack of theology. There were some parts I loved about this book and then not so much. She is funny and if you pick this read out, you will laugh and feel like you are with a good friend that enjoys life. I loved how she addressed about over committing ourselves and it is ok to say no. I also loved and I mean loved how she addressed Christianity in 3rd world countries such as Haiti. Theology is either true everywhere or it isn’t true anywhere. This helps untangle us from the American God Narrative and sets God free to be God instead of the My-God-in-A-Pocket I carried for so long. . This is a true statement, however, I felt her book was somewhat contradictory do that very statement. Would her book be Jesus to the women of Haiti? One of her suggestions being which I would love to do is take vacations with friends as couples. Vacations are good for the soul for refreshment and if you are lucky enough to have friends that you can share that time or even being able to have a vacation at all, that would be great. It’s like saying look how blessed I am and be happy for me. I am not sure what I can do with that but be happy for Jen Hatmaker. I am not saying this with sarcasm but trying to understand how there are those with limited resources can do with that advice. Jen Hatmaker has plenty of sarcasm of her own that is funny and is to help the reader or as she puts it “loved one” to not take it all so seriously. To laugh and enjoy those that God puts in your path which I totally can get on board with. If you want a book like that, this is for you, if you want theology, you might want to look elsewhere. I think she quoted the bible maybe a handful of times so that might tell you if you are looking for that kind of encouragement. Being from the state of Texas, everything is big and Jen’s personality is as well. But along with her big personality, she does have a big heart! Some quotes that I found encouraging that have the Jen Hatmaker’s sarcasm spin. Thank you for inviting me into this good thing of yours. It is as extraordinary as you are. But any new “yes” I give means a “no” to my family and sanity. Please accept my sincere regrets and count on my prayers,” most people are amazing. You can say no, and no one will die. If you husband knows you love and want him, you empower him in every other area. This is one place he is vulnerable, and your desire in the bedroom is more than loving; it is powerful. Thank you, Maxi dresses, for helping me appear dressed up, as though I really made an effort, but making me feel as if I’m wearing a nightgown in public. You are basically crotchless yoga pants and I salute you. A fun read to be sure! A Special Thank You to Thomas Nelson and Netgalley for the ARC and the opportunity to post an honest review. I picked this up on Audible because I've seen friends talking about it and it's prayer and fasting week at our church. This year I decided to only read/listen to books to grow my faith for the week and just see what comes out of it. It's been interesting. I liked the title of For the Love, so took a gamble. Let me warn you - this is not a book about theology. Or really very much about grace. I see a lot of people are kind of upset about that. I guess that's about our own expectations and I didn't really have any, so I just rolled with it. Hatmaker is seriously funny. I'm not one to respond with much more than a chuckle most of the time, but I literally laughed out loud more than once while listening. The thank you notes and leggings are not pants just about did me in. Because she was seriously in my head. I love the concepts presented about community and finding your tribe, about building a happy, healthy life and letting people - especially yourself - off the hook for what is honestly out of their control. I think the "grace" message here is having grace with yourself and with others so each of us can find out who we really are - not necessarily the "big G" Grace message of the cross. Maybe that's where people are getting confused. Another warning - if you. like me, are struggling with starting a family, this book is heavy on the family stuff. Really heavy. Lots about being a mom and dealing with kid stuff and the incredible blessings that children are. All of this I agree with and support whole-heartedly. But... I'm one of those women who may not be able to have children. And we're not sure adoption is the direction we need to look in either, so some of that got a little hard to listen to. This is not anyone's fault and I know for most women, motherhood is a HUGE part of their lives and their identities. I just want others like me to be aware before they dive in that it could touch some sore spots. I had to take some time and deal with some lies about being "on the outside" in this area.